If you look at the right hand side of my blog, you'll see a fairly short list of links to sites I like. More links are under the links tab at the top of my page. One of those links is Auntie's Beads and it's been there for almost as long as this blog has been up. Because the site has good prices and some of the best "How to bead" videos I've seen on YouTube. Look on the side bar of their page under resources for those. So when they asked if I wanted to use some beads and post a project made with them, I jumped on the chance. They sent 5 sparkly strands of faceted crystal beads. The first thing I made was the pair of earrings above. They are very simple to make, have a ton of sparkle and shine, and the design can be changed up to suit other looks very easily by changing the metal and color of the beads. So if you used gunmetal with jet and metallic plum it would be very dark and gothic. Copper with bright colors would be a great Bohemian look. 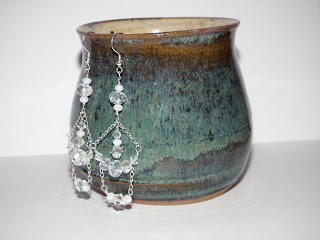 The earrings are very light to wear and have a lot of swing. I work with my wire right on the coil or spool so I have less waste. Check out their glass beads page for lots of colors and options. Cut off 2.5 inches of the wire and make a wrapped loop. String on a 3x5 rondelle, 6x8 rondelle, 3x5 rondelle, Make just the loop part for the bottom, don't wrap it yet. Add on 3/4 inch chain, 1 decorated head pin, 3/4 inch chain. Finish loop. Cut off 3 inches from the wire. Start a loop on the end, slide that on one 3/4 inch chain, and finish the wrap. String on 4 mm bicone, 1/2 inch chain, 4x6 rondelle, 6x8 rondelle, 4x6 rondelle, 1/2 inch chain, 4 mm bicone. Hold the beads in place while putting a soft curve in the beaded wire. Because of the shape of the beads, you need some "slack" in the wire or extra space. If you wrap the second loop without curving the wire first, you might not be able to curve it. Start the loop at the end, slide the other 3/4 inch chain on the loop, finish the wrap. The bottom piece is done with a 2 inch piece of wire. Make a small loop on one end. Slide the half inch chain on the loop, finish the wrap. String on 1 3x5 rondelle,1 6mm bicone and 1 3x5 rondelle. Make loop, slide the other chain on the loop, finish the wrap. Repeat for the other earring. The basic technique is pretty adaptable and makes a great project while watching tv. If you wanted, you could skip the head pin entirely and add more layers of chain sections for longer, even more sparkly earrings. 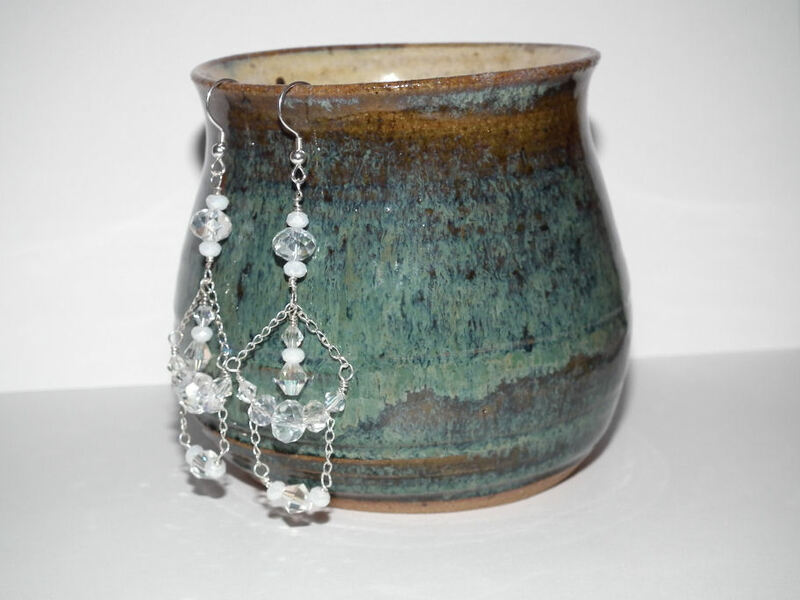 The cup I displayed the earring on is part of my personal collection. I love my no handle cups for tea or chocolate on cold days! This one was made by Ember Haynes of Silverbear Sundries.